Let’s say I’m planning a wedding and I’d like to create a Google site as a centralized place for my guests to RSVP and gather all of the information they need. First, I need to create my site. I visit sites.google.com and click Create site. After choosing one of the many wedding site templates, I’m ready to begin personalizing it. 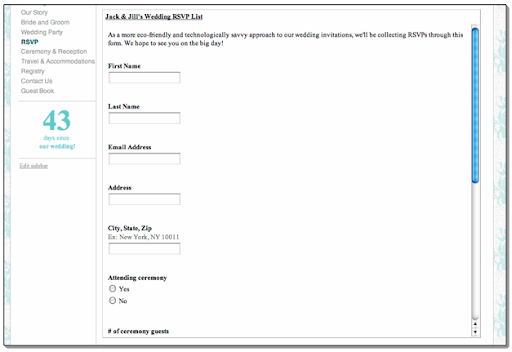 I’d like to include the RSVP form on my wedding site because even though I sent paper invitations, embedding a form in my site makes collecting RSVPs easier and more streamlined. When guests visit the site to RSVP, they can also find out more about the bride and groom, the registry, and event details, among other things. To collect RSVPs, I’ll want to create a form in Google Docs. 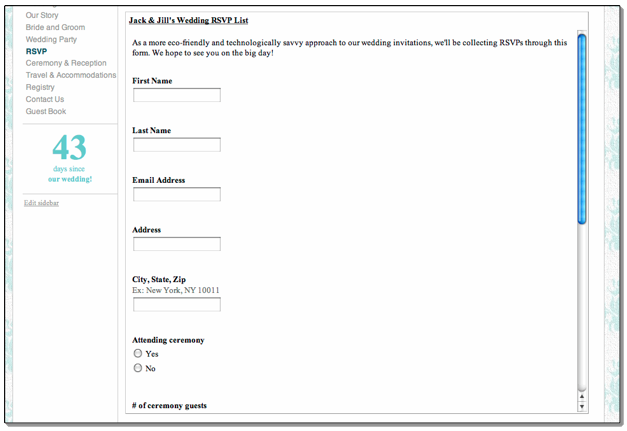 Once I do this, I go back to my site and create a new page on my wedding site where I want to embed the RSVP form. I can add a title or any additional text to the page I’ve just created. 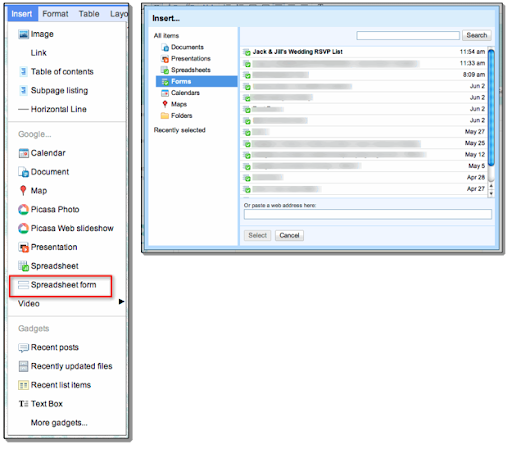 Next, I go to the Insert menu and select Spreadsheet form. I’d like to select the RSVP form I’ve just created to embed on this page of my site. My guests can now visit my site to RSVP to the wedding and simultaneously get all of the information they need about the ceremony and reception. 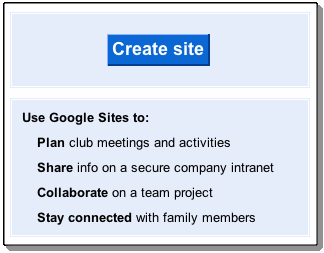 You can embed any Google document, spreadsheet or presentation in a Google site using the Insert menu. On my wedding site, for example, I can embed a Google document outlining travel and accommodation for wedding guests or a fun slide presentation about how the bride and groom met. Embedding Google Docs in a Google site helps you easily deliver information to your friends, family, colleagues or students in a centralized and organized way. 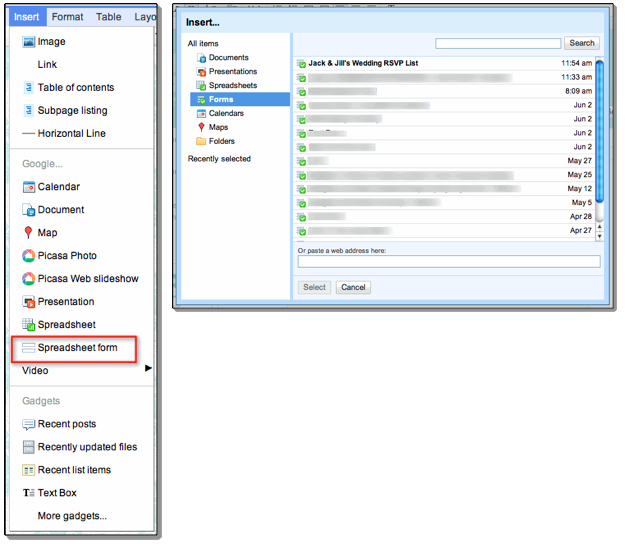 Embedding a Google document, spreadsheet, presentation, or form in a Google site can help you easily publish and share information in one central location. Embedding is different from simply copying and pasting information into a site because if you make a change to any of your embedded documents while using Google Docs, the changes will be reflected on your site.